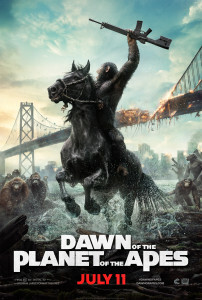 Dawn of the Planet of the Apes picks up about a decade after the events of 2011’s Rise of the Planet of the Apes. A human engineer named Malcolm (Jason Clarke) is trying to restore power to what’s left of the human race in San Francisco led by Dreyfus (Gary Oldman). His team stumble upon the home of the ape population who live near the dam Malcolm’s team is trying to restore. The apes, led by Andy Serkis’ motion-capture performance as Caesar push back and a series of attempts at diplomacy and cooperation lead toward an uneasy peace with neither side fully trusting the other. San Francisco has been beautifully reclaimed by nature and the apes’ settlement in Muir Woods is intriguingly designed and filmed. This post-apocalyptic world is one where the planet itself seems to thrive while the humans and apes survive with varying degrees of success. As one of the human characters puts it, the apes’ strength is that they don’t need electricity and heat to survive this new reality. The series is known for dealing with themes of xenophobia, tribalism and the importance of communication. This movie excels at presenting those arguments and showing us the faults and striking similarities between the humans and apes. While the movie might be a bit long-winded for younger audiences at 130-minutes, it’s an engrossing film that manages to keep the violence and language in check and feeling like a great use of the PG-13 rating. The visuals set a bar in the same way that Jurassic Park did over twenty years earlier, but the story is much better here with a focus on the tension and drama equaling that of the action sequences. It’s a movie that will leave you thinking about the us vs. them mentality that parallels in our own society between different cultures and nations. Rise of the Planet of the Apes was a very good film. Dawn of the Planet of the Apes is a masterpiece.